Star Wars is epic saga directed by George Lucas and first film was released under same name back in 1977 Star Wars is epic saga directed by George Lucas and all six parts have earned some USD 4,382,000,000 making this saga financially and historically respectable. The movies are made and released under following order: Star Wars Episode IV: A New Hope 1977, Star Wars Episode V: The Empire Strikes Back 1980, Star Wars Episode VI: Return of the Jedi 1983, Star Wars Episode I: The Phantom Menace 1999, Star Wars Episode II: Attack of the Clones 2002 and Star Wars Episode III: Revenge of the Sith 2005. The most impressive character worth to watch this SF film series is Darth Vader, actualy all films are telling the story of his ascent, fall and final redemption. 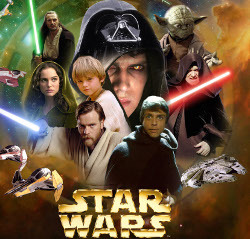 This half human half cyborg creature is binding all six movies together and watching them you will see how innocent and merciful boy and powerful Jedi becomes ruthless, brutal killing machine in the power of Dark Side that on the end finally decides to change and make all good (or backwards). Do you know that in Return of Jedi, Darth Vader is played by David Prowse (under mask), James Earl Jones gave him the voice, and human Vader is played in original from 1983 by Sebastian Shaw that is in 2004 DVD release replaced with Hayden Christensen (Anakin Skywalker from Attack of the Clones and Revenge of the Sith). This proves complexity of his role, and some psychiatrists have even considered Darth Vader as a useful example to explain borderline personality disorder to medical students. No matter on different public and criticism opinions, the movie/s must be seen by every serious SF fan. anonymous: "George Lucas is greedy jerk! Star Wars are good and Indiana Jones is good too but fact remains that guy is what he is!" anonymous: "another SF anthology that will get massacred by JJ Abrams. One that will be known in future as father of soap pop SF. Junk." Solve this complex math: 9 + 8 = ?